Matthew Hall has just become a member of my Hall of Shame. 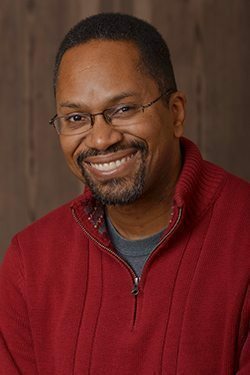 To become a member doesn’t require much, simply accept an invitation from Dr. Humility (C.J. Mahaney) to speak at Mahaney’s run-away church plant which meets at the Marriott Hotel in Louisville. It’s not that tough to garner an invitation to speak at Mahaney’s church as he is constantly searching for men willing to lighten the preaching load of the overworked pastoral staff of five. The 5 pastors of the SGM Louisville church plant. Mahaney is flanked by his brother-in-law and son-in-law. Accepting the invitation to speak does require a few things. First and foremost is you must not have any concern for the many victims of sexual abuse; abuse which C.J. Mahaney covered-up. It would seem Mahaney delights in getting prominent men to speak at his church because it indirectly validates his ministry. Second, you must not think that C.J. Mahaney blackmailing a fellow pastor disqualifies him from the ministry. Third, you must be willing to engage in the obligatory brown-nosing of C.J. Mahaney in the first few moments of your sermon. The guest speaker ingratiates himself to Mahaney by telling the congregation how fortunate they are to have Mahaney as their pastor. Such a humble man, such a giving man, such a wise man; I find the praise to be repulsive and empty because in reality Mahaney is none of these things; well I guess you could call him generous, he has donated several hundred thousand dollars of money donated by the faithful SGM’ers to Al Mohler’s Southern Baptist Theological Seminary and, according to Mark Dever, he has also given money to Capitol Hill Baptist church. 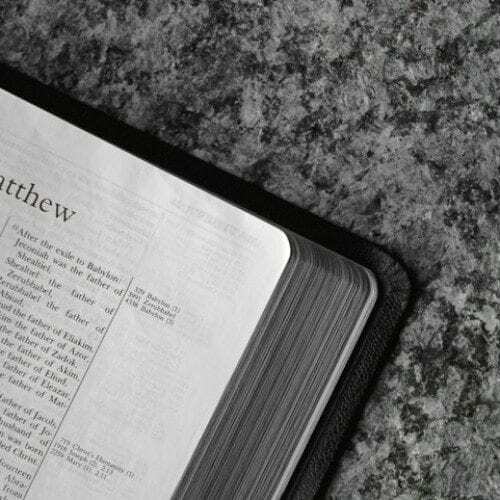 If you listen to Matthew Hall’s introduction below it sounds like Hall’s church may have also received some funds from the Humble one. This resolution was passed because many Southern Baptist members were dismayed at the close relationship between C.J. Mahaney and Albert Mohler/Southern Baptist Theological Seminary. For further information read this post. One note on Hall’s remarks – he mentioned how pleased he was to see the multiplication of gospel-centered churches in Louisville, stating there were not that many 14 years ago when he arrived. Hall remarked that it is the kindness of God to the city of Louisville to have Mahaney’s church in their city. (There are literally thousands of former Sovereign Grace church members across the country who would question Hall’s discernment based upon this statement!) I wrote an article in June 2013 in which I questioned why it was so vital for Mahaney to plant a church in Louisville; at the time I wrote the article Louisville had nearly 3,500 churches. Granted not all of them would meet the “Gospel-centered” tag as defined by Hall, but there are hundreds of Baptist churches to choose from. Clearly Mahaney had other motives for choosing to plant a church in Louisville as it obviously is not a city starved for “Gospel-centered” churches. I view Hall’s remarks to be disingenuous. I do not see Southern Baptists exercising any discernment in their affiliations with Mahaney’s church. Quite the contrary. 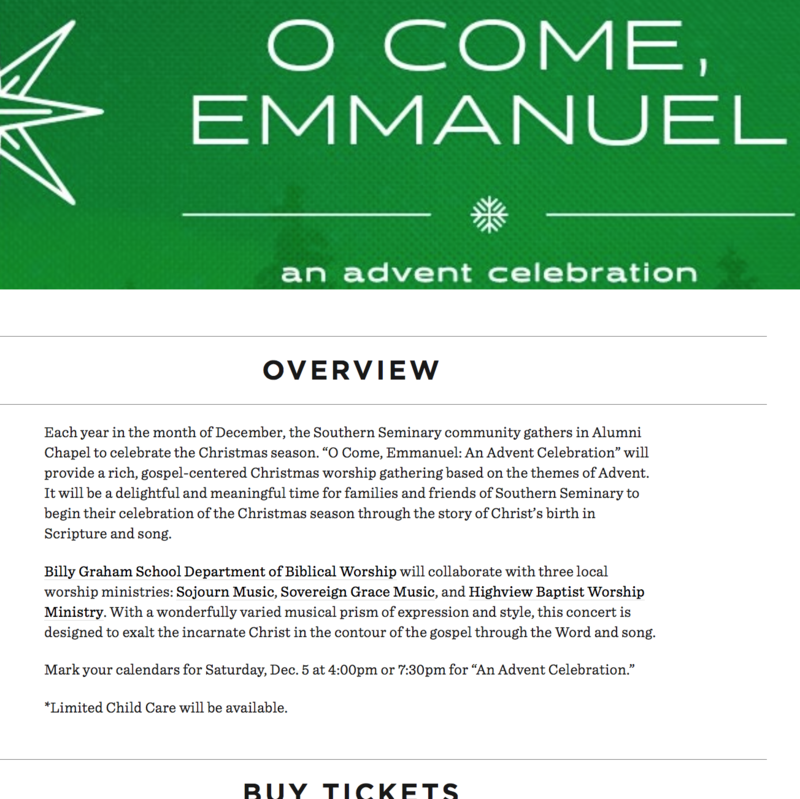 As seen below, Sovereign Grace will be performing at Southern Baptist Theological Seminary’s Christmas program! 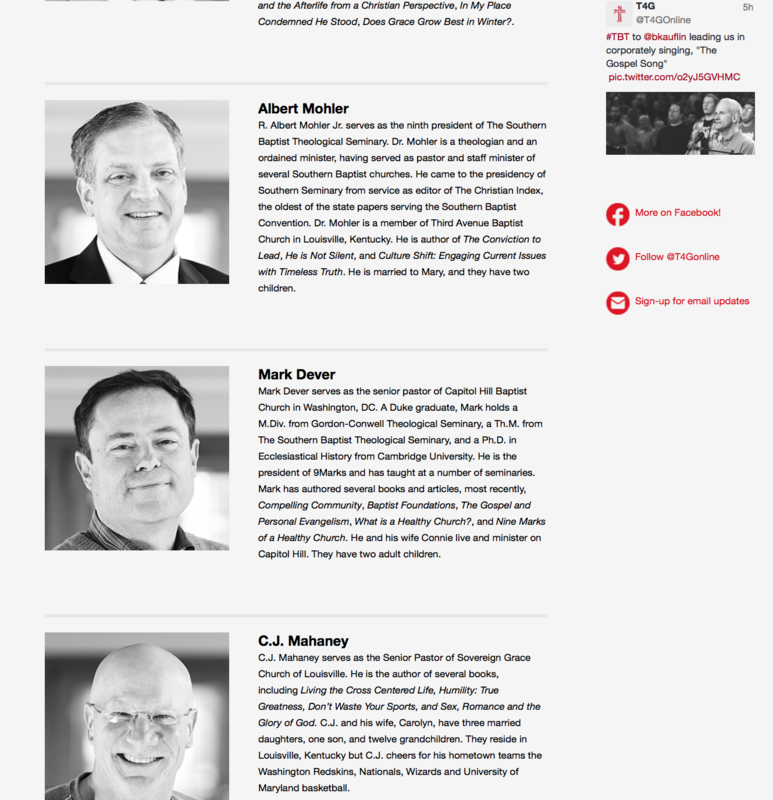 And then, of course, Mahaney is slated to rejoin his Southern Baptist friends Albert Mohler and Mark Dever for the Together for the Gospel conference in April. I seriously question why the SBC even bothers having National Conventions. It undoubtedly is an expensive venue where many issues are considered and resolutions passed, all of which are non-binding and, obviously, largely ignored. 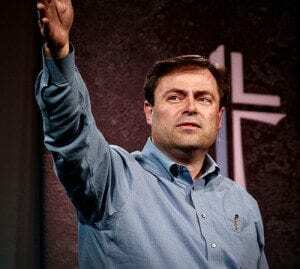 When two high profile leaders like Mohler and Dever thumb their noses at National Resolutions a very poor example is set for the rest of the denomination. I am tired of these preachers infernally praising each other in front of the church members. This promotes idolatry. If you constantly have to tell everyone how humble a guy is, he probably isn’t all that humble. I read somewhere that narcissists are drawn to the preaching profession in much higher percentages than other lines of work. My experience verifies this. I want to be careful not to lump all preachers into this category; I have known some truly humble preachers. The truly humble ones would be embarrassed by the types of opening comments made by Matthew Hall. But in recent times these types of over-the-top praise the clergy class lavishes upon one another seems to be the norm. I seem to recall someone of importance saying that the greatest of all is the servant of all! 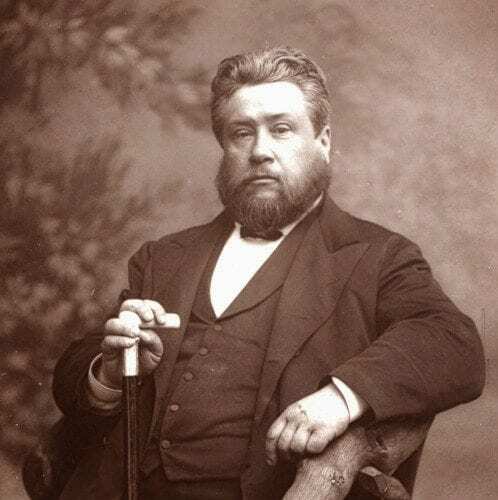 Have you ever heard a preacher praise the parking lot attendant or the nursery worker from the pulpit? I suggest the humblest people in the local church are not the ones with the microphone in their hands. It all points to the sickening celebrity culture in American Evangelicalism. One thing that grieves me is the fact that some truly humble preachers are fooled by these narcissists. I have actually spoken with two of the men who preached at C.J. Mahaney’s run-away church plant in Louisville, KY, both are what I would consider to be “minor celebrities” on the conference speaking circuit. One actually told me he did not think there was anything Mahaney had done that would disqualify him from the pulpit. He based this on conversations he had with Jeff Purswell and Bob Kauflin. Of course, both men are longtime close friends with Mahaney and assistant pastors at Mahaney’s church. Talk about foxes guarding the hen house! I suggested he contact Brent Detwiler to get the facts on Mahaney. He first acted like he had no knowledge of who Detwiler was, and then he said he didn’t have the time to speak with Detwiler. It seems to me that, in the interest of personal credibility, one would want to know the truth about a man prior to endorsing his ministry by speaking at his church. I agree that there are humble people bamboozled by the narcissists and frauds in the “Celebrity Christian World.” At the same time, I also see lots of willfully ignorant people, such as the two Todd mentioned above, as well as many folks who just look the other way when the subject of child sexual abuse comes up regarding a Church/Pastors they’re familiar with. We all do resort to using avoidance as a problem solving strategy, but it is not a good long-term approach to solving a big problem such as covering up child sexual abuse. The Catholic Church found that out the hard way and, unfortunately, I think the American Evangelical Church will as well. While over at the Girl Blather website did you pick up any of their barn-wood signs for Christmas gifts? Not sure, but I believe the signs are produced by a kindergarten craft class! This literally makes me ill.
Ditto Sara. These men are modern day pharisees. 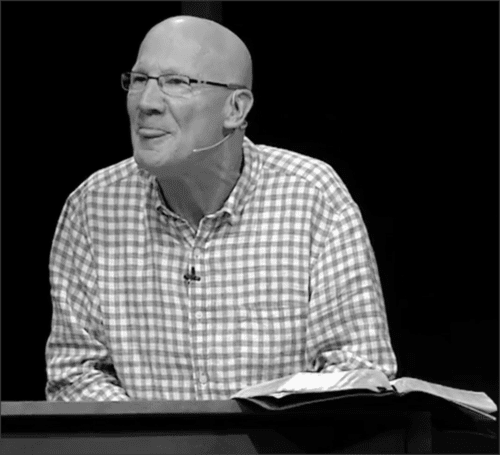 Today our dad, CJ Mahaney, gives us his much anticipated, tenth annual Christmas shopping list for the reader in your life. Then they link to a list that consists of little more than links to books Al Mohler has reviewed over the past few years. I don’t think anyone is looking forward to seeing a list of books that C.J. has never read, gals, now that he’s the leader of a 200 member (max) Church rather than a 28,000 member denomination. Thanks for the article, Todd. It’s interesting that that none of the men preaching at Mahaney’s Church think that they may be the ones who need to be saved, despite the criticism they’ve received for at least indirectly enabling pedophilia, wife-beating, mis-managing funds, and other less-than-savory behavior. Out of curiosity, do you think that being a white male is also a pre-requisite for preaching at Mahaney’s Church? I don’t see any diversity of ethnicity whatsoever in either the leadership of SGM Louisville or its guest preacher list. That’s interesting given that about 23% of Lousiville’s population is reputedly African American or Latin American. The neo-Calvinist movement in the USA is basically lily white. Look at the make-up of the elder boards for any of these churches and you will realize what I am talking about. Clifton Baptist, home church of Matthew Hall has all white males on their elder board. This includes the two latest appointees. I don’t have an answer to why this is. I have noticed these white leaders are writing more articles about racial issues, perhaps they are feeling guilty over their lack of diversity. Thanks, Todd. I wasn’t sure if Thabiti Anyabwile had spoken at SGM Louisville or not. From what I see, diversity for these guys consists of sending white missionaries overseas to preach to non-white people. That doesn’t seem very progressive. Hey Buddy!, I found this information for you: "Matthew Hall Joins the Hall of Shame". Here is the website link: https://thouarttheman.org/2015/12/10/matthew-hall-joins-the-hall-of-shame/. Thank you.